In the mid-November Battle of Guadalcanal, the Japanese failed in their greatest effort to recapture the southern Solomons. Nevertheless, their troops fought on doggedly. The enemy air force frequently attacked Henderson Field, and hostile light surface craft and submarines continued to infest the waters bounded by Guadalcanal, Savo, and Florida Islands. Gradually, however, the increasing American land force on Guadalcanal began to thrust the Japanese back, maintaining a pressure which proved more and more effective. COMSOPAC’s War Diary for the latter part of November contains numerous reports from the Commanding General on Guadalcanal of minor encounters with Japanese troops. Day after day witnessed the dislodging of small enemy units from positions threatening Henderson Field. Toward the end of the month, the reports assumed a larger significance. East of the Tenaru River our forces dispersed the Japanese troops. The Marines crossed the Matanikau River (scene of much bloody fighting, 20–26 October) in force, and drove relentlessly westward under cover of naval bombardments until, as December approached, they passed well beyond Point Cruz. Plans were formulated for a general attack to eliminate all Japanese resistance on the island. The final offensive was postponed, however, pending the Army’s relief of the First Marine Division. During the change-over, which continued through December and most of January, active shore operations on Guadalcanal were confined to patrol probings of enemy lines. For some time after the Battle of Guadalcanal, the Japanese appeared to have abandoned their troops to slow but inevitable extinction. The unfailing indicator of their intentions—the amount of shipping in the Buin-Faisi area—fell rapidly after the middle of November, and remained low for a week or 10 days. On the 24th, however, Japanese shipping concentrations began to grow. Three days later the number of vessels in Buin and Shortland harbors was reported to have mounted from a mere dozen the previous week to 25–30, in addition to small craft. An enemy move in force to supply and reinforce his southern Solomons positions seemed imminent. If American troops were to continue their successes, this attempt had to be balked. Our victory at the Battle of Guadalcanal, though overwhelming, had cost us 18 ships sunk or so badly damaged that extensive repairs were required. With the exception of destroyers, COMSOPAC’s only available surface units were the carrier Enterprise, the battleship Washington, and the light cruiser San Diego at Noumea and the heavy cruisers Northampton and Pensacola at Espiritu Santo. Several other ships were, however, en route to the South Pacific. By 25 November, as the enemy’s aggressive plans became evident, we had assembled a force adequate to counter the expected offensive. At Nandi in the Fijis lay the carrier Saratoga, the battleships North Carolina, Colorado, and Maryland, and the light cruiser San Juan. The heavy cruisers New Orleans, Northampton, and Pensacola, and the light cruiser Honolulu were stationed at Espiritu Santo. These last two, together with the heavy cruiser Minneapolis which arrived on the 27th, had come from Pearl Harbor. Here also on the 27th were the destroyers Drayton (which had accompanied the Minneapolis), Fletcher, Maury, and Perkins. The plan divided the Task Force into one destroyer and two cruiser units. Each unit included at least one ship equipped with SG radar and one ship with CXAM or SC-1 radar. The Minneapolis, New Orleans and Pensacola formed one unit under Admiral Wright. Admiral Tisdale led the second cruise unit composed of the Honolulu and Northampton. The four destroyers comprised the third unit under the command of the Senior Officer Present, Comdr. Cole, in the Fletcher. Much of the plan was general in nature, and not relevant to this Narrative. It contained, however, six Annexes, two of which are of particular interest: the communications plan (which included instructions for the use of radar) and the course of action prescribed for a night engagement. Unit commanders were to assign radar guardships for continuous all-around search, and for surface search with SG equipment as practicable during the hours of darkness. Unidentified objects detected at night were to be reported by TBS to the unit commander, who was instructed to acknowledge the report. Three conditions of radar operation were set: (1) unrestricted radar use; (2) search equipment to be used only by the flagship or the radar guardship—a restriction designed to lessen the likelihood of the enemy picking up emissions from CXAM and SC radars, but not affecting the free use of SG and FC radars; (3) all CXAM, SC, and SG-1 radars to remain silent, responsibility for search falling to the SG’s. The tactical plan governing the movements of Task Force WILLIAM in a night engagement were set forth at length in Annex “F”. Its most important provisions were: (1) the cruisers were to form a line of bearing normal to the general bearing line and 4,000 yards astern of the destroyers, which were to stand 30º on the engaged bow of the cruiser line. (2) First contacts were expected to be made by radar. (3) The engagement was to open with a torpedo attack by the destroyers. Once their blow had been delivered, the smaller ships were to follow the cruisers in engaging enemy cruisers or destroyers, and to provide starshell illumination if so ordered. (4) It was hoped to keep the range greater than 12,000 yards until after the torpedo attack, when shellfire would commence at a range of from 10,000 to 12,000 yards. Fire was to be opened under radar control and to be maintained, if possible. If not, individual ships were authorized to illuminate by starshells. Use of searchlights was specifically forbidden. (5) Fighting lights were to be employed only if our ships were fired upon by friendly vessels. Task Force WILLIAM remained on 12 hours notice throughout most of 29 November. Positive information regarding Japanese intentions was meager. COMSOPAC could only anticipate another expedition to supply Guadalcanal, not when it might be made or in what force. Three hours later COMSOPAC ordered Admiral Wright to proceed with all available units, pass through Lengo Channel (between Guadalcanal and Florida Islands), and intercept the Japanese off Tassafaronga on the northwestern shore of Guadalcanal. Later, Admiral Wright received information that enemy combatant ships might be substituted for the transports, or that the Japanese force might consist wholly of destroyers, and that a hostile landing might be attempted off Tassafaronga earlier than 2300, 30 November. He received no further advices respecting the size or composition of the opposing units. Admiral Wright promptly put into effect, with minor modifications, Admiral Kinkaid’s operation plan, and set midnight as the zero hour for his ships to sortie. Actually the destroyers got under way at 2310, the cruisers at 2335. The whole Force cleared the well-mined, unlighted harbor of Espiritu Santo without incident and shaped its course to pass northeast of San Cristobal Island. Two planes were catapulted half an hour before sunrise on 30 November with orders to return to Espiritu Santo and report for temporary duty to COMSOPAC. At approximately 1700 the cruisers launched their remaining planes to proceed to Tulagi. These aircraft were furnished with parachute flares. Their pilots had instructions to search between Lunga Point and Cape Esperance, starting at 2200, to report all enemy ships sighted to Admiral Wright, but not to release flares unless so directed by him. Just before Task Force WILLIAM entered the Channel, it encountered a friendly east-bound force consisting of 3 transports and 5 destroyers, including the destroyers Lamson and Lardner. Admiral Wright had known that these vessels were in the general area, but became aware of their actual location only at the time of meeting. “Collisions were narrowly avoided,” and Task Force WILLIAM reduced speed, first to 20 knots, then to 15. At 1850 the Lamson and Lardner had received orders from COMSOPAC to join the Task Force at the entrance to Lengo Channel. The junction took place at about 2100. Comdr. Abercrombie, in the Lamson, now became Senior Destroyer Officer Present. As it was too late to communicate the details of the operation to him, and therefore impossible for him to assume command of all the destroyers, Admiral Wright directed the Lamson and Lardner to take up a position astern of the cruiser column. Cruisers change course to 320° T., destroyers taking parallel courses. All ships turn to 280° T.
Minneapolis’ SG radar picks up two objects off Cape Esperance. Simultaneous turn made to place cruisers and destroyers in columns. Course changed to 300° T. by head of column movement. Comdr. Cole asks permission to launch torpedo attack on enemy formation of 5 ships, distant 7,000 yards. Van destroyers deliver torpedo attack, followed by gunfire and starshells. Van destroyers retire westward around Savo Island. At 2223 the cruisers changed course by head of column to 320° T., with the destroyers taking up parallel courses. About 15 minutes later, all ships formed on a line of bearing of 140°, on a course 280° T. At the same time SG radars began to search the Guadalcanal shoreline for indications of the enemy’s presence. The SG on the Minneapolis, which had played a large part in navigating the Task Force through Lengo Channel, picked up the first contact with the enemy. At 2306 what appeared to be “a small wart on Cape Esperance” became visible on the PPI screen. It grew larger until it finally detached itself from the outline of the land mass. It bore 284° T., at a distance of 26,000 yards. Admiral Wright immediately informed the rest of his Force of the radar contact. Gradually the number of ships on the Minneapolis’ SG screen increased, until by 2315 seven were clearly perceptible. They were proceeding at 15 knots on a southeasterly course. Shortly after learning of the Minneapolis’ contact, the Fletcher picked up two enemy vessels, bearing 285° T., 14,000 yards off her port bow. Tracking immediately commenced, revealing five ships, four about one mile and a quarter off Guadalcanal, the fifth half a mile outside and abreast of the second ship. A solution of 15 knots on a course of 140° T. was obtained. At 2316, as the enemy formation bore 243° T. at a range of 7,000 yards, Comdr. Cole in the Fletcher requested permission to launch torpedoes. Admiral Wright inquired if the targets were within range, and, upon receiving an affirmative answer, authorized the torpedo attack. Two other van destroyers noted the presence of the enemy. The Drayton’s SG picked up five ships after the Fletcher reported contact, but for some reason the plot was erratic, giving a target speed of zero. No Japanese ships were visible from the Perkins until 2315, when the SC equipment revealed five vessels bearing 284° T., approximately 3,000 yards from Tassafaronga Point and 14,480 yards from the destroyer. Radar plot determined the course of this target as 125° T. and the speed 15 knots. Although the number of ships appearing on the Perkins’ screen was the same as that on the Fletcher’s, the discrepancy in bearings was so great (Perkins 284°; Fletcher, 243°) that if the bearings were accurate the two groups of ships must have been widely separated. The Maury had no SG equipment and could not locate the enemy at this time. Steaming 1,000 yards astern of the flagship was the New Orleans. Her SG also failed to discover the Japanese ships for several minutes after their appearance on the Minneapolis’ screen at 2306. Eight minutes later, however, what appeared on the SG screen to be a reef close to Guadalcanal was identified as a column of ships, with a single vessel on the flank. This Japanese formation stood 14,000 yards from the New Orleans, and although the bearing was not recorded, it was doubtless the same formation as that observed by the Fletcher. The experiences of the other cruisers in the column varied. The Pensacola, third in line, lacked SG equipment, and made no radar contacts until well after the Minneapolis had opened fire. Next came the Honolulu, which, despite constant SG search on the bearings and ranges reported by the Minneapolis and Fletcher, observed no enemy ships for several minutes. Last in the column was the Northampton, which had no SG radar, and had to depend on the reports of the other ships. Neither of the two rear destroyers, also lacking SG equipment, was able to locate the Japanese. At approximately 2320, having received authority to launch a torpedo attack, the Fletcher fired 10 torpedoes in two half salvos by SG control. The center of the Japanese line bore 267° T., at a distance of 7,300 yards—a torpedo range of 9,600 yards from our leading destroyer and 8,200 yards from the Drayton in the rear. Simultaneously the Perkins launched eight torpedoes, recording the range as 5,000 yards. Because she still could not obtain a target speed of more than zero, the Drayton only fired two. The Maury had no positive contacts and did not fire at all. Barely a minute after the torpedoes were launched, Admiral Wright ordered all ships to open gun fire, and the van destroyers began firing 5-inch shells and starshells. The Fletcher selected the rear enemy ship as her target. It was 7,500 yards distant on a bearing of 188° T. After firing about 60 rounds in two minutes, the Fletcher lost her target from the FD radar. She therefore ceased firing and retired to the northwest around Savo Island, followed by the other three destroyers astern. At the time Comdr. Cole reported the target range from the Fletcher as satisfactory for a torpedo attack, seven enemy ships could be seen on the Minneapolis’ radar screen, and their range had decreased to about 10,000 yards. The flagship selected a target 9,200 yards off her port bow on a bearing of 260° T. This vessel stood farthest right in the Japanese formation; the ship farthest left bore 239° T.
Assisted by starshells from the port 5-inch battery, the main battery of the Minneapolis fired four salvos at what was finally identified as a transport. The first salvo was somewhat over, but the next three were directly on. After the fourth salvo, the transport “violently disintegrated,” and the flagship momentarily checked fire. One minute after the Minneapolis opened, the New Orleans began firing her main battery, directed entirely by radar, at an enemy destroyer 8,700 yards distant on a bearing of 220° T. Personnel in the New Orleans noticed that this target, moderately illuminated by starshells from the van destroyers, was receiving fire from others of our cruisers. The destroyer apparently blew up after the New Orleans’ fourth salvo. The Pensacola had difficulty in locating a target without an SG radar. She searched with her FC on the bearing and at the range reported by the van destroyers and soon picked up an unidentified object. Tracking began just as Admiral Wright gave the order to fire. With the aid of FC, and starshell illumination from either the Honolulu or Northampton, the Pensacola opened fire on what her officers believed to be a light cruiser steaming at 17 knots 10,000 yards off the port bow. The target lay to the left of the ships under fire from the two forward cruisers. Because the first three salvos proved only near-hits, the Pensacola resorted to her own starshells for better illumination. Ships astern also fired at the same target which was seen to sink when the Pensacola’s fourth or fifth salvos landed. Shots from other ships and smoke in the target area made identification difficult, but no one in the Pensacola doubted that the Japanese ship was a cruiser. Fire ceased temporarily when the vessel sank. The Honolulu could find no target until at least two minutes after the Minneapolis and New Orleans had begun to fire. At about 2224, starshells from our heavy cruisers lighted up a Japanese destroyer. The FC radar shortly picked it up and the Honolulu commenced firing on this target, which bore 250° T. at a mean radar range of 9,600 yards. Half a minute of rapid fire produced several hits, but fading illumination left the target scarcely visible through the smoke and splashes. Accordingly the port 5-inch battery fired several starshell spreads. Reports from the rangekeeper indicated a steady decrease in the vessel’s speed. By 2327 it had ceased moving. After one more minute of concentrated fire, observers in the Honolulu saw the enemy destroyer break up and sink, and immediately checked their fire. Without an SG radar, our fifth and last cruiser, the Northampton, experienced great difficulties in locating the enemy. The land background of Guadalcanal balked all efforts to pick up with the CXAM the contacts developed by the other ships. Finally the main and AA batteries were trained toward the fall of shot from the other cruisers, and the FC promptly located a destroyer target. Shortly thereafter, Plot reported a satisfactory solution on the rangekeeper and the main battery opened fire, using radar train. The target, on a relative bearing of 325° and at a range of 11,500 yards, could not be seen until the third salvo landed. Despite frequent hits, the enemy destroyer had not sunk before the danger of collision with cruisers ahead forced the Northampton to change course. Neither of our rear destroyers could locate the Japanese at the time our cruisers began the action. Visibility was so bad that the Lamson’s personnel could see only two cruisers ahead. Neither the Lamson nor the Lardner succeeded in picking up radar contacts. As the action opened, the SG screen on the Minneapolis showed the Japanese proceeding on a southeasterly course, but shortly thereafter it indicated that the hostile column had made a 180” turn and that several ships had progressed well to the right of the original bearing. Our flagship’s second target, reported as a destroyer with a single raked stack, lay to the right of her first target at a distance of 10,500 yards. Capt. Rosendahl of the Minneapolis observed that the New Orleans was also firing on this ship. When the fourth salvo from the Minneapolis struck the destroyer, the latter’s bow and stern rose as though she had broken in two, and a few seconds later she disappeared. Gunfire by the Pensacola had been temporarily checked as her first target disappeared from view. Within a few minutes her FC radar detected another Japanese ship about 5° to the right of the first, scarcely 8,000 yards away. As our cruiser fired her first salvo, the vessel emerged from the smoke and became clearly visible. It had one large stack, like the Yubari or cruisers of the Mogami class. Moreover FC radar indicated a heavy ship. Smoke billowed from her stern, though whether it resulted from our fire or mechanical generation could not be determined. Virtually all the shells of the Pensacola’s second salvo landed abaft the stack. A great explosion followed, after which the ship disappeared both from sight and from the radar screens. Spot I and several officers confirmed its destruction. As no other Japanese ships were immediately visible, orders were issued to unload the Pensacola’s guns through the muzzle. Our two rear destroyers now entered the battle. In the absence of a target, the Lamson fired starshells to help illuminate the enemy formation. The Guadalcanal land mass completely blanketed the search and fire control radars of both destroyers. As the Lamson changed course to 300° T., she sighted 3 enemy destroyers bearing about 260° T., just to the left of splashes from the salvos of the cruiser column ahead. At 2225 the Lardner commenced to fire on these ships at an estimated range of 9,000 yards (target angle 270°, speed zero). After three salvos from the forward guns, she lost the target and had no success in discovering another. Certain facts, however, must have produced considerable concern in the American ships. Foremost was the uncertainty regarding the composition of the Japanese forces. Advices prior to the battle led Admiral Wright to expect six enemy destroyers, plus combat vessels or cargo ships. The flagship’s SG screen pictured only seven ships; the Fletcher’s revealed eight. No more vessels were seen or located by the radars. In most previous night actions the Japanese had divided their ships into two or more groups, and nothing indicated a reason for a change of formation on 30 November. The enemy profited by the presence of the land mass of Guadalcanal at his right, while Admiral Wright’s device for revealing its position by means of parachute flares failed because the planes did not arrive on schedule. Moreover, the night was so dark, visibility so limited, and flashes and smoke in the target area so confusing that it was impossible to obtain a clear idea of what was taking place. Up to 2327, the results of our gunfire furnished ample cause for optimism. There was reason to believe that several enemy ships had been sunk. Our radar search seemed most effective, except just before the van destroyer torpedo attack, which had been launched at an excessive range. We had apparently surprised the enemy—a prime advantage in any night action—and disrupted his retaliatory power. For a brief moment victory seemed to be ours. The Minneapolis received her first hit forward of turret I, abreast the aviation gasoline compartment. An instant later, another torpedo struck No. 2 fireroom. The second hit followed so closely that many personnel felt only one explosion. Fire immediately blazed up in the forecastle, sending long tongues of flame into the air. Huge sheets of water mounted so high around the port side of the ship that in falling they appreciably checked the forecastle fires, and flooded the navigating bridge. Clouds of smoke and acrid fumes billowed over the bridge, but did not penetrate the pilot house. Fumes and flames from burning gasoline and oil swept aft over the fantail, drenching personnel in Sky Aft with oil and water. Two men near the port 5-inch battery were blown overboard. As the flagship shuddered and rolled drunkenly from side to side, many other personnel suffered severe bruising against bulkheads. The entire bow section tore loose at frame 22, folded downward, and dangled from the rest of the hull. The water level flowed aft as far as No. 1 barbette. Soon firerooms 1, 2, and 3 were flooded and all personnel inside were drowned or suffocated. Men less courageous than the crew of the Minneapolis would have considered their part in the engagement ended. Nevertheless the turrets quickly resumed fire on the third target. The flagship’s speed had been greatly reduced, and her tenth salvo passed directly over the stacks of the Pensacola, racing by to port. Unhappily, the machinery of the Minneapolis did not equal the heroism of her crew. After one more salvo, firing ceased as power failed in all turrets. The ship slowed rapidly, and steering control was momentarily lost. Partly because of the immersion of the bow, the fires in the forecastle soon subsided. A 4° list to port was almost halved by pumping oil overboard and jettisoning all available heavy objects. Faced with the helplessness of the Minneapolis and her inability to remain in action, Admiral Wright now ordered Admiral Tisdale in the Honolulu to assume command of the Task Force. When the Minneapolis was torpedoed, the New Orleans had to come hard right to avoid ramming her. The burning flagship seemed to be done for. Rarely a minute passed before the New Orleans herself received a torpedo hit on her port bow. The gasoline stowage and magazine groups 1 and 3 exploded, and the entire bow as far aft at the barbette of turret II was blown away. All personnel in both forward turrets lost their lives. The bow floated aft along the port side, tearing gaping holes at frames 130 and 136 just above the waterline. With the rifles of turret I pointing skyward it soon sank off the port quarter. Steering and engine control from the New Orleans’ pilot house failed, as did communications between the pilot house and Battle II. The ship swung right and steadied on an easterly course in the general direction of Tulagi. As far aft as frame 42, the main deck was wrecked. The second deck was missing forward of frame 31, and flooded aft to frame 42. The explosion had torn out everything below the second deck forward of frame 31. All forward magazines blew out. As the Pensacola now came round 20° to her base course of 300° T., a radar search to the right of the previous target picked up an unidentified ship proceeding at high speed on a course of 295° T. at a distance of 12,000 yards. The Pensacola opened up again with radar-controlled fire, but the first salvo disabled the after FC. Because the forward radars could not spot, resort was had to ladder spotting. Firing ceased as the target disappeared following the third salvo. At this time observers noticed small splashes close aboard on the Pensacola’s port bow. About 2 miles due south of Savo Island, the Pensacola steadied on a course of 300° T. at a speed of 20 knots. At 2339 without warning a torpedo struck the port side aft, outside the fuel tank forward of turret III. The oil ignited instantaneously, causing raging fires throughout the cruiser. Fuel was blown as high as the maintop, transforming the mainmast into a blazing torch and roasting all the personnel in Control Aft to death. Much of the hose on deck caught fire, and by the time the remaining lines were connected the flames were so intense that they could not be extinguished. Time and again they seemed under control only to blaze up anew as more oil gushed from the fuel tanks. Just as her first target broke up, the Honolulu had to sheer out of column with hard right rudder to avoid colliding with the Minneapolis and the New Orleans. She kept right for three minutes. Zigzagging to avoid torpedoes, she opened fire under a starshell spread on a second target 7,000 yards to port. Smoke from oil burning on the water near our damaged cruisers, as well as that in the area of the enemy, obscured the target. Several starshell spreads failed to reveal the presence of this or other Japanese ships. One torpedo hit frame 108 at the waterline, the other struck frame 98, 10 feet below. The resulting damage was similar to that on the other three cruisers. Fuel and diesel oil ignited and sprayed in flames over the mainmast structure and the boat deck, where it detonated the 5-inch ready ammunition. The explosion blew out the ship’s port side between frames 105 and 113, leaving eight feet of skin plate protruding over the side. The main and second decks were torn away from frame 105 to frame 107, then aft to frame 112, and outboard along frame 117. At first the Northampton listed to port 10°, then, notwithstanding all efforts lessen it, the angle increased to 20°. Capt. Kitts stopped the ship in the hope that she would right herself, bur when the list reached 23° he ordered the bridge abandoned, the firerooms secured and all personnel brought topside. At 0130 all hands except the salvage crew were ordered over the side. Twenty minutes later, the Fletcher and Drayton (which had rounded Savo Island in company with the Honolulu) received orders to rescue the Northampton’s officers and crew, and shortly thereafter started picking them up. The cruiser’s fires increased as steadily as her list and the water supply at the fire mains fell off ominously. At 0240, when the list reached 35°, Capt. Kitts and the salvage party abandoned ship. On the morning of 1 December, just after 0300, the Northampton turned on her beam ends, then rolled over and sank stern first. An hour later, the Fletcher and Drayton had completed their search for survivors, rescuing all 57 officers and 716 men. Not until 0001 on 1 December did Admiral Tisdale receive Admiral Wright’s TBS message of 2333 placing him in command of Task Force WILLIAM. A tense situation confronted the new commander. The four van destroyers were far ahead, their fate unknown. Four of the 5 cruisers had been knocked out of action. Somewhere in the rear steamed two remaining destroyers with only the vaguest notion of what had taken place. In the Honolulu neither the radars nor the naked eye detected a single enemy ship. Yet in view of the multiple torpedoing, it seemed clear that a number of undamaged Japanese ships were still at large the sound. The ships were soon identified as our van destroyers. Admiral Tisdale instructed them over TBS to begin a search for our crippled cruisers and then followed them around Savo. A searchlight beam was seen just over the horizon to the southeast at 0013, sweeping toward the Honolulu. She promptly reversed course, placing Savo between herself and the searchlight. As she doubled around the northwest side of the island, friendly planes dropped flares over the beach near Tassafaronga and reported damaged vessels offshore. Admiral Tisdale ordered the Honolulu to stand down to bombard these ships, but the aircraft later notified him that the vessels sighted were only burnt-out hulks stranded in previous engagements. The Honolulu now shaped her course south and southeast from Savo toward Lengo Channel. At about 0133 Admiral Tisdale granted Capt. Hayler’s request to reverse course and retire between Savo and Cape Esperance. Shortly thereafter the Fletcher and Drayton, complying with instructions to stand by the cruisers, joined the Honolulu. After the van destroyers opened the action with their torpedo attack, they fired several rounds of starshells and from 50 to 100 rounds of service ammunition with no perceptible results. At 2327 they retired to the northwest to skirt Savo Island under orders from Comdr. Cole in the Fletcher. While steaming along the west coast of Savo, they made several radar contacts. At 2330 the Fletcher’s SG radar showed one Japanese ship bearing 190° T. at a distance of 12,500 yards, close by the beach at Cape Esperance. The FD radar was matched in train, but could not pick up the target which eventually disappeared from the screen. At 2337 the Drayton’s SG radar located three ships to the north of Cape Esperance heading on a course paralled to the Drayton’s at a distance of 12,000 yards. Four torpedoes were fired without observed result. As the van destroyers rounded Savo, they noticed several splashes astern and the wakes of several torpedoes. Frequent zigzagging enabled them avoid the torpedoes, and none of the shells dropped very close. At 0004, when the destroyers reached the northern side of Savo Island, speed was reduced and recognition lights were flashed. A TBS message from Admiral Tisdale directed Comdr. Cole to dispatch two destroyers to stand by the New Orleans, then reported to be 10 miles east of Savo. At 0058 the Maury and Perkins left on this mission. At 0120 the Fletcher [and] the Drayton sighted the Honolulu and fell in astern of her. As previously noted, these three ships very nearly ran into the Northampton and her survivors. For three and one-half hours the Fletcher and Drayton engaged in rescue work. The Fletcher’s whaleboat was lowered, under the command of Ens. C. F. Gressard, and began to tow several rafts back to the destroyer. So many men on the first raft grabbed for the gunwale that they capsized it. Efforts to right the boat had to be abandoned in order to free men for other activities. A motor whaleboat from the Northampton now came alongside the Fletcher, which manned it with a crew consisting of L. C. Jenkins, Seaman Second Class; J. F. Gephardt, Machinist’s Mate First Class; and J. W. Jarrell, Seaman Second Class. These men worked with “praiseworthy” zeal for two hours, towing rafts and boats to the side of the Fletcher from which hung four cargo nets, two floater nets, and all available sea ladders to aid the survivors in climbing to the deck. Others of the Fletcher’s crew went over the side to rescue men so weak at they could not reach the nets. J. E. Howell, Fireman First Class, swam out over 100 yards several times to carry lines to struggling survivors. All told, the Fletcher picked up 42 officers and over 600 men from the Northampton. Similar instances of cool courage marked the rescue operations conducted by the personnel of the Drayton, who took aboard 15 officers and 113 men—including four stretcher cases—without the aid of a power boat. Time after time, Ens. J. F. Ryan swam back and forth to assist exhausted men into the Drayton’s motor whaleboat. Once they gained the deck of the Drayton, the men of the Northampton received unsparing attention from Lieut. William M. Pope, medical officer, who went without sleep for over 30 hours to treat their many cases of bruises, burns, and shock. 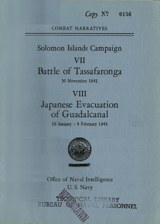 In the Tassafaronga action on the night of 30 November 1942, Task Force WILLIAM opposed the first important Japanese attempt to reinforce Guadalcanal after the decisive engagements of mid-November. The battle opened auspiciously. Task Force WILLIAM apparently possessed the initial advantage of surprise. This it implemented by excellent gunnery, which, so far as CINCPAC could determine, resulted in the sinking of the Takanami and three other Japanese destroyers and the damaging of two or more others. On the other hand, not a single enemy shell struck any of our ships. This repulse of the Japanese, however, was only achieved at severe cost to the United States Navy. During the second phase of the battle, the enemy launched an amazingly effective and devastating torpedo attack which resulted in the sinking of one heavy cruiser (Northampton), and serious damage to three others (Minneapolis, New Orleans, and Pensacola). Losses in personnel during the action consisted of 19 officers and 398 enlisted men. Although neither destroyer had suffered damage, the situation confronting Comdr. Abercrombie was dangerous in the extreme. As already quoted in part from his Action Report: “No information was obtained concerning the disposition of enemy forces, what might be encountered, no recognition signals, no reference or rendezvous points or anything pertaining to the night’s operations. As a result . . . I was completely perplexed throughout the operation and due to the incorrect recognition signals the two ships of this unit were fortunate in extricating themselves without damage from precarious positions.” At 2352 he ordered the Lardner to join him in proceeding toward Lengo Channel where they would await further instructions. 3. As soon as possible destroyers will be ordered to form and attack. It is expected that destroyer torpedo attacks will be made early in order to obtain the maximum benefits of surprise. All radar facilities may be used by destroyers, and the attack should be made on radar information insofar as possible. Results of radar tracking will be furnished the destroyer commanders by TBS. Destroyers must clear expeditiously and in such a positive manner that there is the least possible chance for mistaken identity. All ships having IFF must ensure that it is turned on well before night action, particularly when destroyers are separated from the cruisers. On completion of torpedo attacks and after commencement of cruiser action, destroyers engage enemy destroyers or cruisers being engaged by our cruisers, and be prepared to provide starshell illumination if so ordered. Source: Naval History & Heritage Command.